$449 Includes Shipping in the USA. + Click Photo for large view. The Trail 52cc is the NEXT GENERATION in gas powered scooters! It will speed you around at cruising speed of 30 mph plus! Featuring Dual Disc Brakes, 52cc Engine 2-Cycle (Quiet and Extremely Powerful Motor). and ample ground clearance, the new Trail 52cc works great on roads, trails, grass, etc. This innovative scooter features the absolute finest workmanship and components of any scooter. The automatic clutch gives this scooter the smoothest, safest ride both on or off-road. The heavy duty steering column easily folds down for storage or transport. The Trail 52cc comes fully assembled and ready to ride! This scooter is awesome! 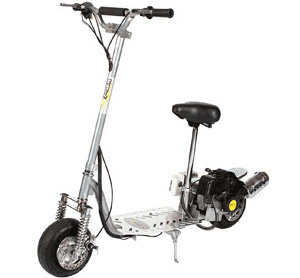 This is a large scooter built tough for both off and on road extreme riding. With some performance accessories speed of 40+ mph will be reached quickly. This scooter folds and fits in the trunk of a car. Now Available in Chrome – Deck and Body Only! What makes the Trail 52cc so good? Quiet and Extremely Powerful Motor! Storage Box w/ Tools Included! POWERFUL 52CC MOTOR — ULTIMATE SMOOTH RIDE!